Happy August! 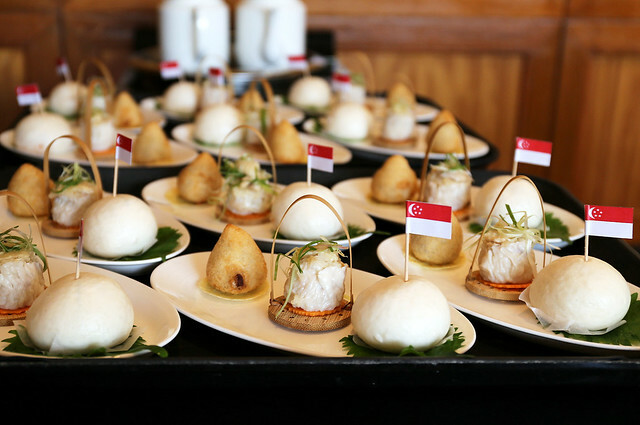 Yes, it's the month of Singapore's National Day, and I'm sure lots of patriotic promotions will be making their rounds. 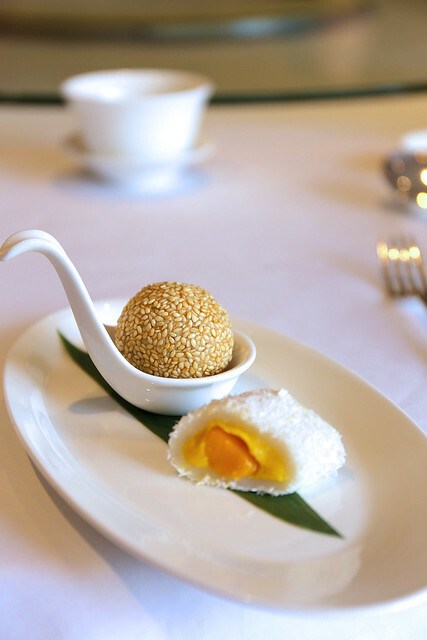 Summer Palace, the very understated but lovely Cantonese restaurant at Regent Singapore has a National Day Set Lunch that celebrates local classics. Your five-course meal begins with a dim sum combination platter which features a Steamed Chilli Crab Pau (right), Satay Pork Dumpling (left) and Sticky Glutinous Chicken Rice (centre) – each a creative spin on well-loved dishes in Singapore. I swear. Don't they look like minions? The chili crab bun is awesome. I liked that the filling was lusciously generous and spicy, although some at the table fed back to the chef that it was too spicy (nooooo, it's just nice, don't change it). 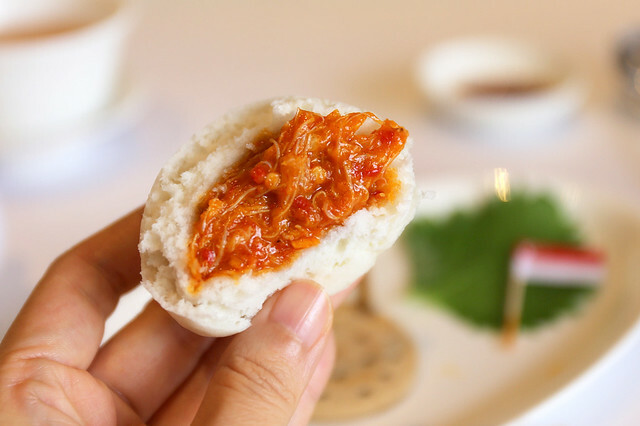 The fried dumpling is like a "ham sui kok" with satay flavoured pork, while the chicken rice "siu mai" is deceptively heavy with the sticky chewy glutinous rice filling up the dumpling skin. We didn't get to see the rest of the dishes, but we got to sample other dim sum that chef Leong Kwok Sing had created for the month of July. You may have seen some of these on my Instagram, or heard me recommend them on 93.8LIVE earlier (note: new timings are 11.45am and 12.15pm). I hope these creations make it to the permanent menu - they are so good. The Steamed Lobster Dumpling is a visual treat. 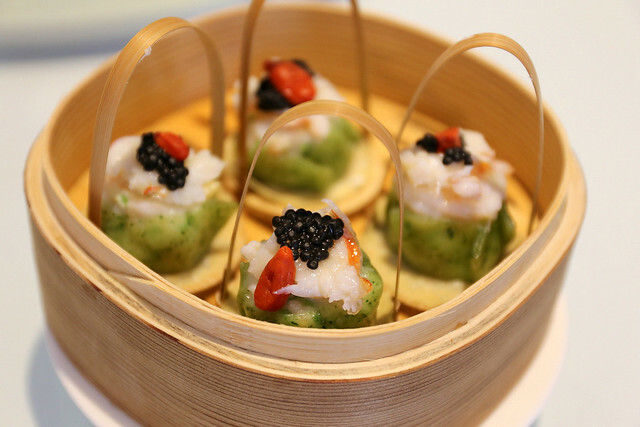 The colours - jade green from spinach in the dumpling skin, the bright red wolfberry and high-shine black caviar all contrast wonderfully with the pristine white of lobster. Best of all, it tastes just as good. The Steamed Bamboo Pith Roll with Prawns Paste tastes even better and was a crowd favourite. 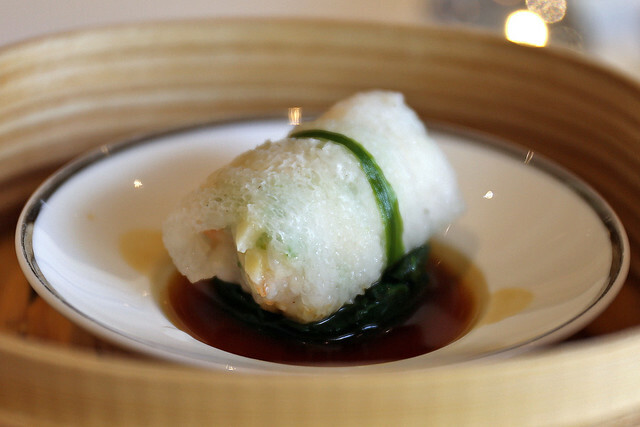 The net-like bamboo pith lends an ethereal crunch to the minced prawns with water chestnuts inside. Mop it up with the savoury sauce below. 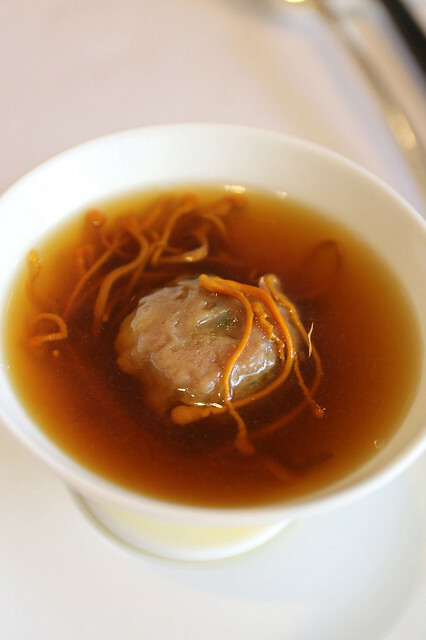 Beef Balls in Superior Broth - each handmade beef ball is delightfully tender, and the soup simply a marvel of Cantonese brewing skills. I normally am not a fan of beef ball dim sum (mainly because I still can't get around orange peel with beef), but this rendition won me over. For something a bit more filling - Deep Fried Duck Meat Bun with Pickled Cabbage. 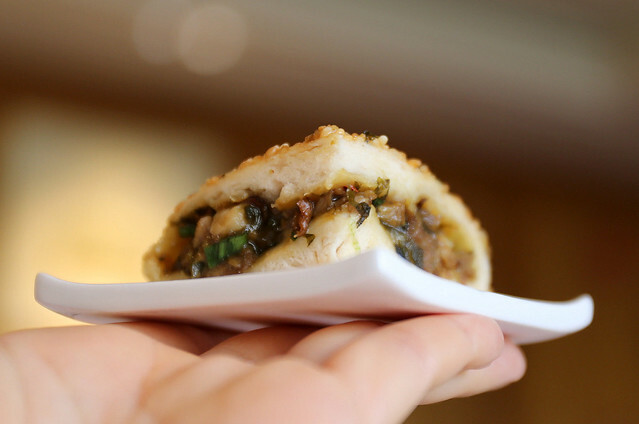 Aromatic savoury duck in a fried bun with fluffy mantou-like texture. 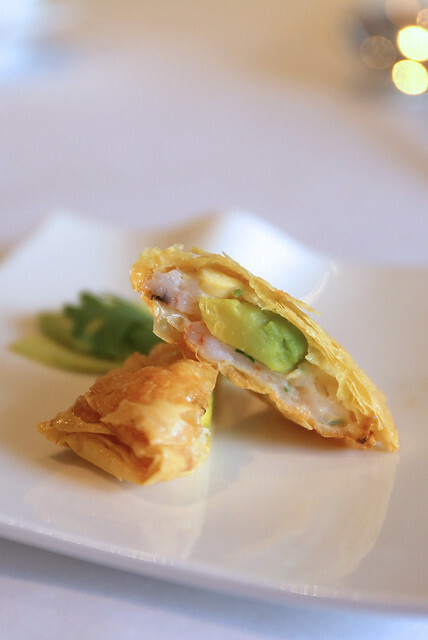 I like beancurd skin rolls, and this was an interesting version with avocado. For dessert, the Deep Fried Sesame Dumpling with Chocolate Mousse (background) is like the chinese version of molten chocolate cake. Cut or bite it and it oozes liquid chocolate. The Sweetened Glutinous Rice Roll with Mango (foreground) is a take on sticky rice with mango. Nice, but the soft roll with the soft mango doesn't provide as much contrast in texture as the original Thai dessert. 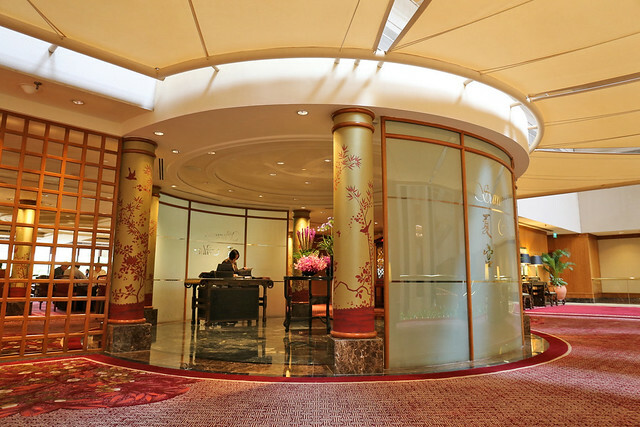 Summer Palace has two Hong Kong chefs and the usual classy traditional interior. While generally low on the radar, it's considered by many as one of the best Cantonese restaurants in Singapore, and sees a bustling crowd for lunch. I know I'll be back for the dim sum.